A couple of months ago, the annual Global Grad Show in Dubai showcased innovative student-led projects from design and technology schools across the world. 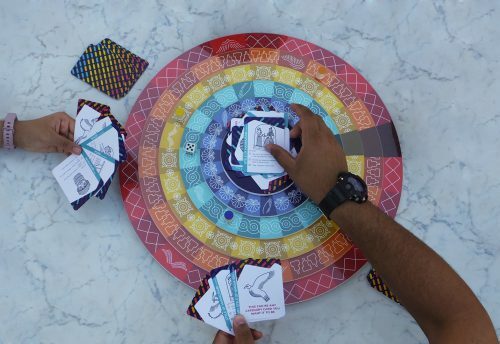 The Amman-based Iraqi designer and artist Durrah Alomar, a recent graduate of the German Jordanian University, presented Imperial Race, a new board game that teaches players about Iraq’s ancient heritage. Alomar spoke to Ruya about the project during Dubai Design Week. Imperial Race, Durrah Alomar, German Jordanian University. Why did you pick a board game as a creative platform for learning? One of the world’s oldest board games, the Royal Game of Ur, was discovered in Iraq. This 5,000 year old game is so timeless that it is played to this day. Board games have made a comeback in recent years, as people seek real social interactions that can relieve them from their screens. The younger generation of Iraqis has lost interest in learning about Iraq’s ancient heritage. A board game is more engaging and easily accessible than a book or a documentary. I also wanted to develop a project that brings people together. What contributed to the decline in knowledge about Iraq’s ancient history. A few years ago I visited the Ishtar Gate at the Pergamon Museum in Berlin. It was a highlight of my time in Germany. Older generations of Iraqis know Iraq’s ancient history and mythology well, but my generation is less informed, particularly those who left Iraq. When my family and I moved to Amman in 2005, my parents kept Iraqi traditions and customs, but they didn’t teach us about our ancient history. How will players learn about Iraq’s ancient heritage? The game board represents a city and players have to race across it in order to claim the title of king. It is a circular board, like the medieval walled city of Baghdad and the different levels are modelled on the social hierarchies of ancient Mesopotamian cities. 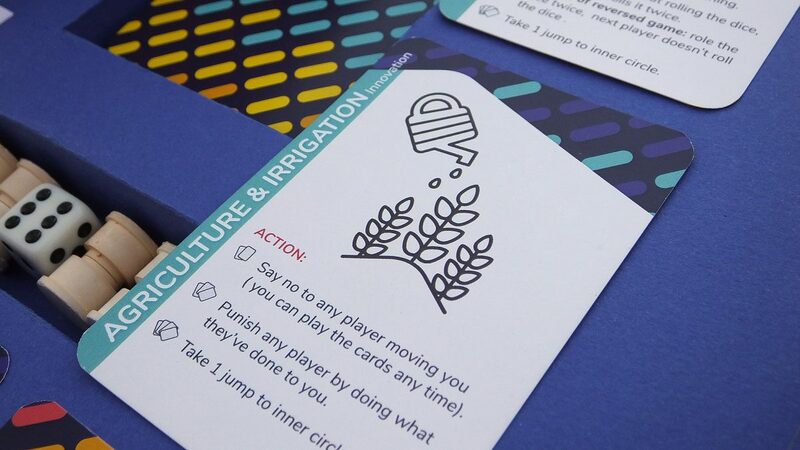 The players collect cards to progress through the game, which are divided into categories like inventions, artefacts and personalities. I want people to play the game because it is fun, not because its educational. The more they play it, the more they will absorb the vocabulary and the images. What were the biggest challenges in developing the board game? Anything is possible when you create a new game, so the biggest challenge was knowing how to apply rules and restrictions. Every time I introduced a new rule, I had to consider so many things. Is it fun? Will it keep players inside the game for longer? Will it help the players learn something new? I’m not a big player myself, and I played a lot of different race and strategy games in order to get a better understanding of them. I developed each iteration of Imperial Race by playing with family and friends. What do you hope the board game will achieve? Iraqis today are divided by their differences in religion and political beliefs. Raising awareness of our shared ancient culture can unite us and strengthen our sense of identity as Iraqis. While I was researching the project, I realised that Iraq’s heritage is also a treasure for humanity. The original prototype was intended for distribution in Iraq, but I have since expanded the game’s remit to include audiences all over the world.